Last year I kind of invited myself to observe the MAPS banding team at Rollins Savanna during the last part of their season. I guess I wasn’t too annoying, because when I invited myself to be a volunteer this year, no one stopped me. I attended a training session with other new and returning volunteers last Sunday. 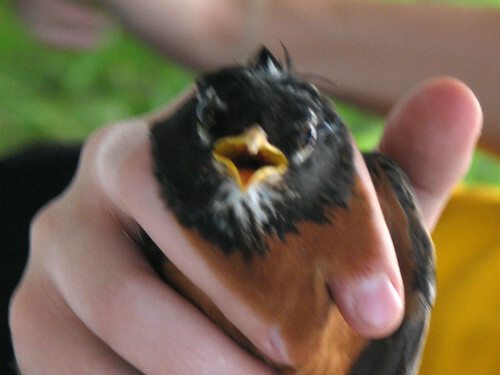 Today was our first banding day for the MAPS program this year. The Monitoring Avian Productivity and Survivorship (MAPS) program calls for 10 mist nets to be set up in an area of about 20 acres. Since this was the first morning of the banding season, we had to locate the old net locations by finding the rebars in the ground from last year. It was warm and humid, and the mosquitoes were out in full force. I have to admit I was pretty miserable during this part of the day. It was hot, we were sweaty and being eaten alive. Once we had all of the nets up it was already time to start checking the first nets for birds. From then on we were all pretty busy processing birds or extracting birds from the nets. It got 1000x more fun, too. There wasn’t much time for photos! 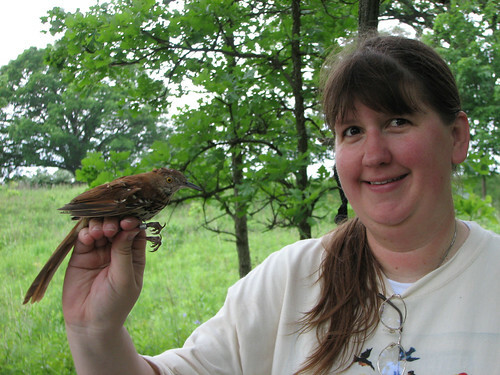 Hopefully in a future post I will be able to share with you a bit more about how we examine the birds and collect data. Those four letter abbreviations, by the way, are shorthand alpha codes used by banders for the data collection paperwork. I have been using them lately when we go birding to keep a list of species we observe, but sometimes I use my own kind of shorthand. I need to break that habit and be sure to use the proper codes for the MAPS paperwork. The usual code is the first two letters of each word for a bird with two names (AMerican RObin). There are different conventions for birds with just one word names (easy: KILLdeer) or three or more word names (Red-winged BLackbird). Some names don’t conform though, because the same code would work for multiple birds. So the Tree Swallow is TRES and the Trumpeter Swan is TRUS, for example. We were lucky with the weather for most of the morning, but at around 9:30 it started to thunder off in the distance. By the time the nets were closed up, it was getting dark and rain was coming. Several of us got completely drenched when it started pouring down as we were taking down the nets. I got full of mud from taking stakes out of the ground. I was filthy and soaked to the bone but I didn’t really mind! That’s how much fun I had on my first full day volunteering with the MAPS banding team. Till next time! This entry was posted in Banding. Bookmark the permalink.